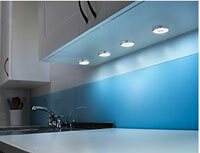 Under cabinet lights in a kitchen is ideal for preparing food etc. on the worktop as it provides illumination without casting shadows. The type of lighting used is usually one of three types - fluorescent, halogen or LED. Some fittings are designed so that the actual light source can be seen whilst other installations are arranged so that the light sources are concealed behind the lower cupboard trim. Whichever type of light source you choose, it’s important that they provide enough light over a large enough area of worktop for them to enable food preparation etc. Fluorescent under cabinet lights are available as both surface mounted (so they can be seen) and strip lighting, which can usually be hidden behind the bottom pelmet of a wall cabinet. The surface mounted style typically uses a Compact Fluorescent Light (CFL) lamp with a GX5.3 fitting, while the strip light will use either a T4 or T5 Tube (0.5 or 0.625 inch dia respectively). The cost of replacement CFL lamps are considerably higher than for the fluorescent tubes. However, these costs are somewhat offset by the low energy usage and longer lamp life. Both types of fluorescent light fitting usually operate at mains voltages. The CFL type are available as dimmable, while the Tubes are not. CFL type usually require a separate on/off switch and wiring, although the fittings can be connected in series under a run of cupboards. Fittings using the fluorescent tubes often incorporate an on/off switch and a power output so that adjacent units can be easily linked together in series. Halogen under cabinet lights are typically fairly big and cannot be concealed behind the bottom pelmet of cupboards, and therefore the housings are usually designed to be attractive and surface mounted. As such, the housings come in various shapes (e.g. round, triangular, wedge shaped etc) and finishes (e.g. various colours, chrome, stainless steel, brass, copper etc). Halogen lights are usually low voltage and so need a transformer to step down the mains voltage. Often a transformer is supplied in kits with the number of lights it can handle although transformers and lights can be purchased individually – it’s important that the number of lights a transformer can handle is not exceeded. Replacement light bulb costs are relatively low but this is offset by a shorter lamp life. LED under cabinet lighting uses high output LEDs (Light Emitting Diodes) so that the light output is comparable with the other types of lighting. They are available in flat profile as strips or various concentrated groupings such as forming circles. These are intended to be mounted under the cabinet so that they are hidden and shine down on to the worktop. LED lights are also available in housings very similar to the Halogen lights. Some under cupboard LED lights are mains powered while others require a transformer, like the Halogen lights, where a transformer is required; this may be supplied in a kit with the LED lights or purchased separately. The initial purchase costs for LED lighting tends to be high however they do have a very long life and are highly energy efficient – unlike the other forms of lighting, their light output tends to reduce over time rather than suddenly failing.